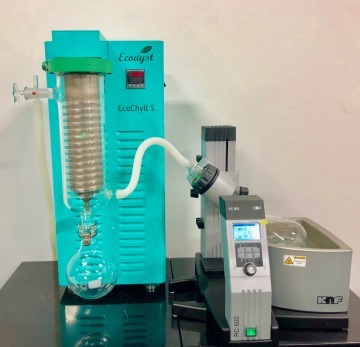 The single condenser EcoChyll X5 22L Evaporator System ideal for medium-scale startup labs.By introducing the EcoChyll X5, Ecodyst now has equipment for any size application ranging from as little as 10mL to 200,000mL. EcoChyll X5 system delivers similar performance as the EcoChyll X7. Intrinsically, the EcoChyll X5 22L system carries powerful advantages, superior to the traditional industrial-scale 50L rotovaps. Your message will be sent directly to Ecodyst and will be answered at their discretion.